A few months back Denise at GeekGirl415 made an observation about the little stick families people put on the back of their SUVs. And how she would find it funny if someone actually put these on with several cat stick figures as well. I thought this to be hilarious. And then I saw it. 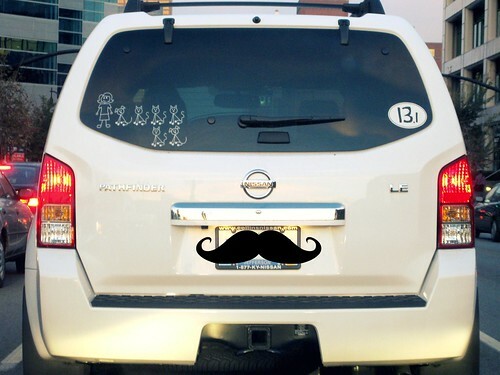 Not long after reading Denise’s post, I happened upon a white SUV with these stickies, only it wasn’t your average family of human-like stick figures. Instead there was adult lady sticky and beside her were four cats and two dogs. I laughed. I’m sorry. And I didn’t even think about picking up the camera. I know that many people think of their pets as their children but I couldn’t help but get a giggle out of it. I saw the SUV a second time on the way to work. Again, I laughed – and Paco didn’t make it to the party. This morning, I spied with my little eye that white SUV. Yes, I added the disguise. No one needs to know who she is. But she knows who she is. katie o. - oh my god! that is awesome. And I’m afraid I know someone who needs those cat stickers too. EEK. Amy - That is awesome! I hate to admit it, but I’d rather see this than stickers of six or more children (which I have seen). Do people have those memorial stickers for relatives/friends who have died on their cars around where you are? Those are just beyond weird. The “disguise” is genius, too! Melissa - That is awesome… I am totally gonna be that lady in a few years!! Wendi @ Bon Appetit Hon - Even my inner crazy cat lady knows that it’s one thing to BE crazy cat lady and it’s another thing to ADMIT being crazy cat lady. Clearly, crazy cat lady doesn’t know this. denise:) - OMG- I love it. I am so happy when I see others out there who have that same twisted sense of humor! And Amy hit upon the other car decals that make me go “hmm”- remembering people who died on their windows… are they looking for sympathy/attention or are they really selflessly honoring a loved one? Melanie - That is hilarious!